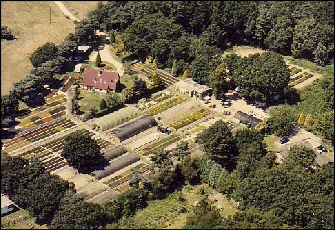 Established in 1974 Forest Edge Nurseries are a major supplier of heathers located centrally in the South of the country and supplying throughout the UK. The nursery provides a wide selection of new, established and novel varieties to nurseries, garden centres and the landscape trade. As a specialist grower we are able to provide the attention to detail that the plant and market requires, with a prompt and reliable delivery service. We source the newest and best varieties from Europe and the USA to enable the supply of a comprehensive range of plants, exhibiting the best flower and foliage colour and providing interest throughout the year. Our heathers are supplied in a range of pot sizes, from our popular 9 cm square to 1 litre, 3.0 litre and 4 litre specimen plants. Tree heathers are available in 3 litre pots. We supply over 100 varieties across the range of Calluna vulgaris, Daboecia, Erica carnea, x darleyensis, tetralix, cinerea, vagans and hybrids between the species. All plants are grown in our own recipe graded compost containing loam and extended slow release fertiliser and allowing for optimum drainage and aeration of the root zone. Plants are individually labelled with colour coded pictorial labels detailing plant information, flowering time and soil preference. We continue to develop and expand the range of our own bespoke pot labels to enhance the plant and its saleability. Healthy stock grown in our own mixed compost with added loam and slow release fertiliser for increased shelf life. 18 plants per tray. Provide an established plant for the customer requiring more impact in the garden or planter. 8 plants per tray. A selection of 6 plants in 9 cm pots. With sturdy handles. Selected varieties grown together in one pot to give added colour and interest. Winter flowering plants ideal for use in Winter tubs and planters. For added height and colour in 3.0 litre pots. Want to speak to us? Email us directly!